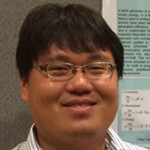 Dr. Kim received his Ph.D. in 2014 from, SUNY Stony Brook. Hisprimary research areas are the mathematical modeling, numerical algorithms, scientific computing and magnetohydrodynamics of gases. Prior to coming to NETL, he was a research assistant in the Department of Applied Mathematics at Stony Brook, where he worked on numerical modeling(1) of atomic processes (ionization and dissociation) and MHD (magnetohydrodynamics) simulation(2) in application to high energy density physics (inertial and magnetic confinement nuclear fusion). This work included deriving a non-equilibrium Riemann solver and implementing this model in the Frontier code (3) and then validating the model with results from experiments on PJMIF (plasma jet driven magneto-inertial fusion) performed at Los Alamos National Laboratory. His current project is the development and application of numerical simulation tools for MHD generators. He is currently developing and validating a one dimension code (using python and Cantera) for quick analysis and system studies and also working on multidimensional simulation tool based on the OpenFOAM library.